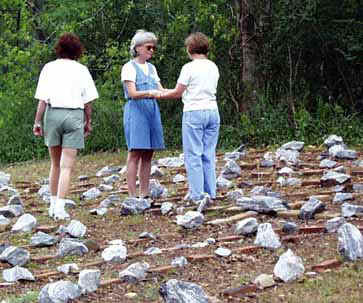 "Rituals are an expression of the human need to belong..."
Labyrinths can be walked in many ways. Different images and metaphors can be used as an aid to the experience. In this section I want to give examples of brief rituals that can enliven the labyrinth experience. A ritual is a structured experience designed to celebrate life. It creates a container in which we can learn more about ourselves and our relationships with others. A ritual deepens our connection to our psychological and spiritual center. Try out these rituals for yourself. If you have other examples please email me so I can include them as well. The most basic metaphor for walking a labyrinth is that of Lifes Journey. Walk the labyrinth while mindful of your life. Envision your lifes goal. Walk to your destiny and see what you learn. Pay attention to the sights and sounds. Do you feel lost at any time? If so, where in the labyrinth did it occur? What does that mean? Do you like one part of the labyrinth more than another? Why? What do the turns represent in your life? Do you resist some turns and like others. When you are outdoors notice subtle changes in the terrain  the ups and downs. Notice any synchronicities such as an overheard word or a birds song. Consider all of your experiences in the labyrinth in relation to your lifes journey. Walk alone and then journal your experience. Walk with a group and then share your experiences. What does the labyrinth teach you about your life? Recently Kate, a friend and member of our healing group, was moving away to another state. At out last meeting together we wanted to say goodbye to her. Since we were at our church where we have a labyrinth, we all gathered in front of it. Kate was asked to walk in first. Others followed after she completed the first circuit. We were entering with about one minute separating the walkers. When Kate arrived in the center, she had time alone as she waited. One by one others entered the center with her and had a few moments to say a private goodbye. They then turned and slowly walked out. After the last goodbye, Kate walked back out of the labyrinth to a group hug. This was a very meaningful and emotional experience. 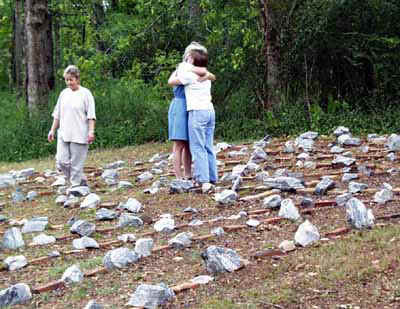 The labyrinth became the container for the emotions of parting and provide a safe and sacred place to share those feelings. Such a ritual would work as well for saying, "Hello." It would be a warm welcome into any group. The labyrinth is often approached with a very serious attitude. It is walked in a slow, solemn, deliberate manner. This is certainly one appropriate way of walking, and I have found it to be very helpful at times. However, the labyrinth also needs to be used in a joyous manner. It can be a place of celebration. Children instinctively know this and almost always run the labyrinth once they enter it. A planned Joy Walk can enliven a labyrinth experience. This is what I sometimes do at a labyrinth workshop. Play a rhythmic music CD such as Mickey Hart's Planet Drum. Give some of the participants children's musical instruments such as bells, rattles, tambourines, and drums. Give some of the participants colorful scarves. Give some of the participants small bottles filled with a bubble blowing mixture and a wand for blowing bubbles. With the music playing the "bubble blowers" surround the labyrinth. Their task is to blow as many bubbles as they can to the labyrinth walkers who are making music or waving their scarves as they walk into and out of the labyrinth. 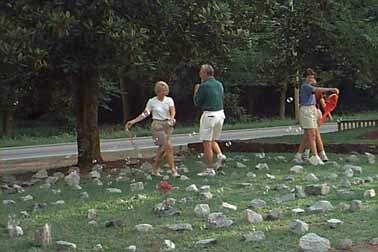 When a walker completes the labyrinth, places are exchanged with a "bubble blower" who now takes the scarf or musical instrument and joyously walks the labyrinth. People always have fun and lessons are learned. One lesson is of spontaneous giving.The "bubble blowers" in their role want to insure that everyone has a good bubble experience while the musicians want to return music for the gift of bubbles. Everyone is giving to the others so that all will have fun. A simple and quick experience for children and adults. Presentation made at the 2000 Labyrinth Society Conference in Fayetteville, Arkansas. Includes some of the information above plus much more.